The Psalms was the single most important Old Testament biblical book in a monastic community: psalms formed part of almost every service and mass, every day. 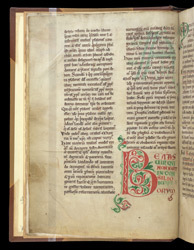 It is therefore natural that the Psalms received special attention from medieval commentators, and several commentaries on the Psalms were written in the 12th century. This copy of a very rare text comes from the Benedictine abbey at Ramsey, about 10 miles north of Huntingdon in Cambridgeshire. Following the start of the commentary is the first quotation from the Psalms, with the opening words of Psalm 1 in coloured initials: 'Beatus vir qui non abiit in consilio impiorum' (Blessed is the man who has not walked in the counsel of the ungodly).